The DD Form 1351-2C, Travel Voucher or Subvoucher (Continuation Sheet) is an additional page for the DD Form 1351-2, Travel Voucher or Subvoucher. The Continuation Sheet is added to the voucher in cases when there is not enough space to accurately document travel itinerary and reimbursable expenses on the original form. The DD 1351-2C was released by the Department of Defense (DoD) in August 1997 with previous editions of the form still being in use. 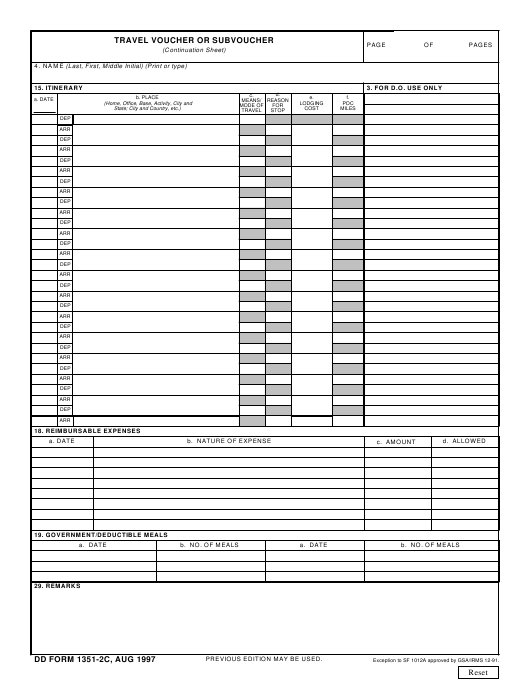 An up-to-date fillable version of the form is available for download or digital filing below. The Travel Voucher Continuation Sheet is part of a series of Military travel and reimbursement-related forms along with the DD Form 1351-3 and DD Form 1351-5. The series was introduced as a means of automated digital data collection for computing reimbursements and pay back individuals traveling for official Government business purposes. Exception to SF 1012A approved by GSA/IRMS 12-91. The DD 1351-2C follows the same filing instructions as the original Travel Voucher. The name of the service member claiming compensation is input in Box 4. The Columns in Box 15, Itinerary describe the dates and places of arrival and departure the mode of travel, reasons for stopping, lodging costs and miles traveled. Box 18 is used for describing reimbursable expenses. Box 19, Deductible Meals is used for listing meals consumed when eating in any establishments other than a government mess (see JFTR, par. U4125-A3g and JTR, par. C4554-B for a definition of deductible meals). Meals received during commercials flights or furnished by private individuals are not considered deductible. DD Form 1351-2, Travel Voucher or Subvoucher is a form containing a full description of a service member's travel routes and travel-related expenses that allows them to claim reimbursement for their money spent traveling for official Government business purposes. DD Form 1351-3, Statement of Actual Expenses is a sheet that contains a detailed table of reimbursable expenses and is used to describe lodging fees, meal, beverage, laundry, and transportation costs. DD Form 1351-5, Government Quarters and/or Mess is a form used to determine if the government quarters or mess facilities were available to the service member during their travel. The authorities can find out if the claimant is entitled to the reimbursement according to the information provided. DD Form 1351-6, Multiple Payments List is a form used for supplementing the DD Form 1351-2, Travel Voucher or Subvoucher.